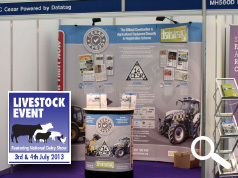 The NEC, Birmingham hosts the opening day of the LIVESTOCK EVENT 2013 featuring the National Dairy and Charolais shows. CESAR, the only official equipment security scheme, has a stand in the main machinery hall alongside leading names, and CESAR registration users, JCB, John Deere and Caterpillar. 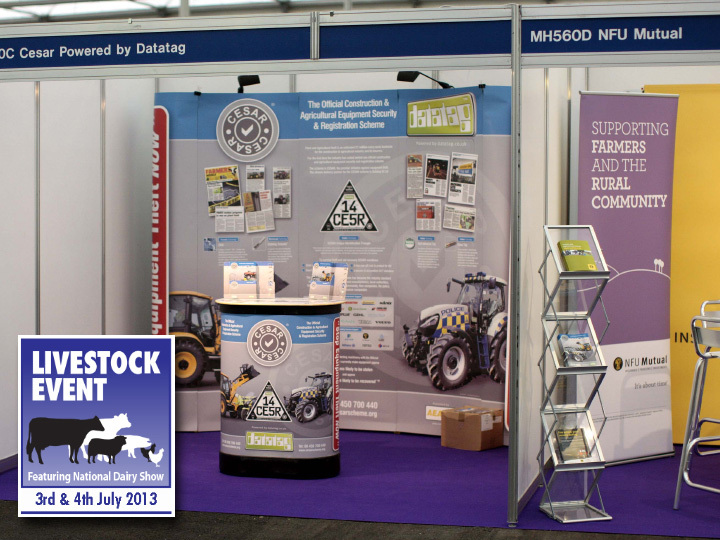 Visitors are able to catch up on the range of CESAR and Datatag security systems that provide ‘total farm protection’. Everything from a laptop computer or riding saddle to a 300 h.p. tractor can be protected with a Datatag or CESAR security system. Leading rural insurer NFU Mutual, exhibiting alongside CESAR at the show, provide insurance premium discounts of up to 12.5% for CESAR equipped machines. CESAR registered machines are 4 times less likely to be stolen and 6 times more likely to be recovered than unregistered machines thanks to the unique ‘fingerprint’ given to each piece of equipment by the range of advanced Datatag technology used in the CESAR security system.